Here's my card for the current sketch at Freshly Made Sketches. I kept it simple here with fun patterned paper, a word die, and a coordinating sentiment stamp. Once I'd decided on a birthday themed design, I picked this fun and festive dotted paper from an older October Afternoon paper collection. After trimming it down to size, I placed it on a golden yellow card base. I adhered a matching wide golden yellow strip, edged with narrow teal cardstock strips, near the bottom of the panel. 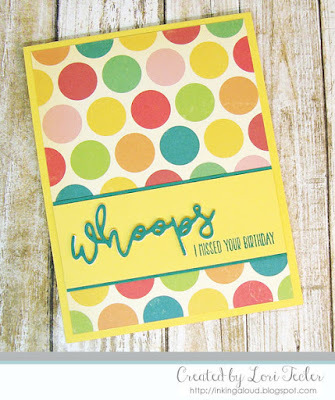 For the sentiment, I used the Whoops word die from Lil' Inker Designs to cut the word "whoops" twice, once from teal cardstock and once from craft foam. After layering the two pieces for dimension, I adhered the word to the yellow strip. The "I missed your birthday" sentiment from LID's Whoops stamp set was stamped to the right of the die cut word near the bottom of the panel to finish the design. It's good to have a belated birthday card or two in my stash--hopefully I won't need to use them! Love this card Lori! It is simple but very sweet! Love the polka dot paper and the sentiment! Thanks for joining us this week at Freshly Made Sketches! Fun sentiment and adorable paper! Such a cute card! Glad you shared it at FMS!